I have always felt lucky to live in the United States. Throughout my life, I have been so fortunate to live in some of our country’s most beautiful places, including the deserts of the Southwest, the prairies of Kansas, the rich pinelands of south Georgia and the rolling hillsides of Maryland and Virginia. Each place holds its own beauty and wildlife treasures. Our country would look very different today if it were not for the actions of some thoughtful leaders, activists and scientists about 40 years ago. We were at a crossroads: Our air and water was polluted and many of our incredible wildlife species were going extinct. We were faced with a stark choice: Do we continue along this path or do we step up and conserve our natural resources? We decided that our country should be one that conserves our air, land, water and wildlife. So we took some bold steps by passing the Clean Air Act, the Clean Water Act, the Endangered Species Act and the National Environmental Policy Act. These laws were passed with broad bipartisan support because conservation of our natural resources was a strongly held American value. But today, I worry. I worry because that value—a value still held deeply by most Americans—is being tested not only by the challenges of climate change, development and energy production, but by politics. At times, the political fate and welfare of the Endangered Species Act seems as uncertain as that of some of the species it so effectively protects. So, we are once again at a crossroads. Will we chose to go down the path of extinction with no care for a responsible future? Or, will we chose wisely once more and recommit to our American values of conserving our natural heritage for ourselves and generations to come? For wildlife lovers, the choice is clear. 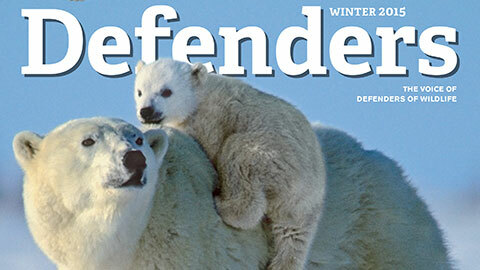 And that is why Defenders has launched a new campaign: “Conservation Crossroads: Extinction or Recovery?” The battles ahead are many and diverse. But together, we can ensure that our elected officials know that we expect them to recommit to investing and caring for our wildlife and natural heritage. I hope you will join us. Visit our website to learn more about our campaign and what you can do to help.